Just a quick short update on an outfit that I've been wearing to work a lot for the past couple of weeks featuring the stars stud skirt that I bought from YesStyle in this post here. It fits within my work dress code as "office casual" with it looking a bit cutesy but yet still appropriate to wear in an office environment. 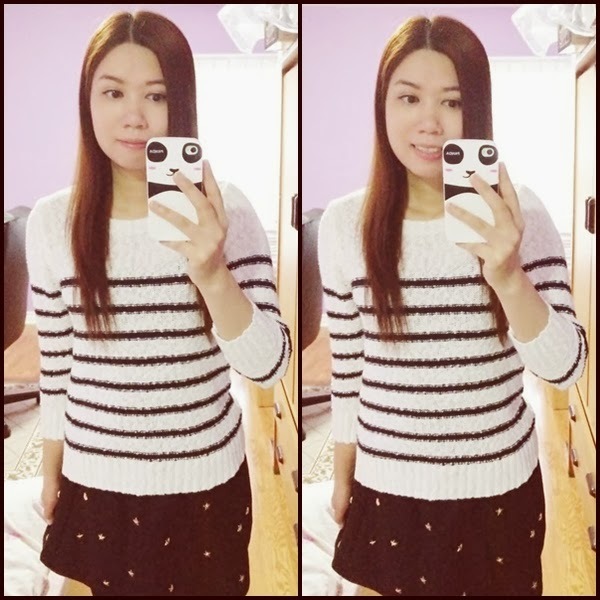 I actually found this white stripe short 3/4 sleeves sweater at H&M while strolling around in there one day after work. I quite like it. It's actually very form fitting and not as thick as my other winter sweaters that I can actually wear it on the warmer days during spring as well. 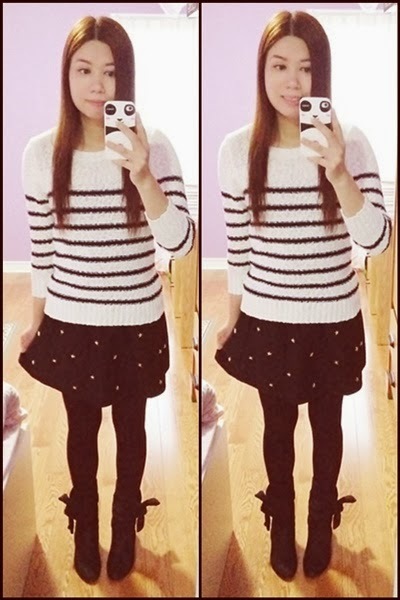 I also picked up two thin layer skirts at H&M recently that I can wear with this sweater paired with some thin pattern tights for a more spring look! Maybe I'll show another spring version featuring this sweater in another outfit post later. Speaking of spring, I'm soooo tired of all the ice and snow we have here in Toronto. I can't wait for the warm weather where I can wear more pastel bright colour clothes and ditch my all black, white and grey outfits. What are you looking forward to in spring? Valentine's Day Sweets And Outfits!